In tonight's episode we finally get answers. We learn what happened to Merlin, why Emma took the memories, why Killian hasn't remembered he was a Dark One, and how Merida and the Camelotians ended up in Storybrooke. Meanwhile, in the present, Robin and Regina give Zelena a four billionth chance to redeem herself, Hook duels with Rumple, and Rumbelle shippers squee with delight and scream with despair. Trust is not easily gained and, once broken, is incredibly difficult to regain. This theme was reiterated throughout this episode. Emma didn't trust her family to understand why she had done what she did with Killian, even though they initially supported her. Because of this breach of trust, they don't trust her and shut her out of what they are doing. Emma doesn't trust Killian to reject the sword or to ask someone to guard it the way she asked Regina to keep the dagger and so he loses trust and respect in her. Then, when he finds she wiped his memory, he turns even further away. Belle has trusted Rumple so many times that now, even with his redemption, she feels the need to protect herself. She loves him, but she can't trust him. And, to counterpoint all of this, Regina and Robin decide to take a massive step of trust and offer Zelena a small opportunity to begin to prove herself. Of all the people in this show, she is the one least deserving of trust, but there is a tiny slivery glimmer of redemption in her interaction with her baby girl. Trust makes or breaks a relationship. The question for the second half of this season, I think, is going to be whether trust can be regained enough to allow these people to work together and to save Hook from himself. 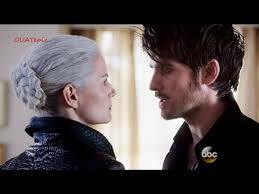 Hook makes a much better Dark One than Emma. Even "good" Dark Hook has a swagger and sassiness that is sadly lacking. But it isn't long before he turns, so I'm beginning to see that Emma's blah-ness is somewhat tied to her continuing struggle not to give into the Darkness. But honestly, I just am finding her not that great of an actress. Her voice is also incredibly getting on my nerves with its oily lethargicness. Okay. Moving on. I really do understand that Hook would be much more susceptible to the Darkness. He's still fighting so hard against his own natural tendency toward evil and I can see how he would feel so betrayed by Emma, but I just have a hard time seeing the man who was willing to sacrifice everything to protect Emma being so very quick to just throw it all away. Regina to Emma: "Fine. You're being stupid. So stop it." And quite an interesting set up for the second half of the season. All of the Dark Ones are back and ready to wipe out the light? And even with all of the answers we did get, we still don't really know Hook's whole plan. So what did you think of the episode?